﻿Many of you saw our proposal last month, thank you for all your feedback. We conducted an extensive bidding process and after narrowing down our list from 15 vendors to one, we are proud to present our new proposal with STRV as our development partner. For your convenience, we've prepared a video walk-through of many of the features that will be included in the initial release. For more details, please refer to our updated proposal overview document. - Based on their successful track record of building high-quality apps, STRV has been named a Google Developer Certified Agency, joining an exclusive club of just 24 other companies worldwide. Chuck quit DCG and to be honest I cannot make heads or trails of his deliverables in 2017 and 2018 except for attending the conferences. I would not want to give him another bunch of Dash after that performance. We have been in contact with Chuck since 2017 when he was still at DCG. At the time, he provided us with valuable feedback on our project and helped align on strategy. His clear and effective communication style drew our attention and we approached him with an offer to act in a limited advisory/communications role with the Nexus team once he was no longer with DCG. This engagement is limited in scope, as we do not have the resources to employ Chuck full time. Since we began our engagement, Chuck has been providing valuable suggestions and feedback on our design efforts, as well as coordinating our beta-test group and arranging multiple communication initiatives. These efforts have allowed our team to keep our focus on developing the platform and will not result in any increases to the overall budget of the project. I'm glad to see this might pass. I hope whoever buys my dash enjoys it! Recently the core team budget proposals have caused quite some damage to other small community proposals. The reason for this damage is that small proposal owners were unaware that core were intending to drop in a 3rd funding proposal after they had posted their first two proposals in the last voting cycle. Core team claimed that they had given notice of their intending funding request by a forum post however a) most people posting proposals were not aware of this post (including myself) b) When I found the post it was not obvious how many proposals core intended to post and for how much. Therefore even if people found the core post they would not have know that there was to be a third proposal dropped in and how much it would be for. To circumvent this problem from occurring again I made a suggestion to Glenn Austin of core to post at the top of every one of their current funding proposals a notice of how many funding proposals they would intend to post in the current superblock. In this way proposal owner can check any one of the core proposals and see instantly what other core proposals were due in the current funding month. I can see that on this funding month core have implemented this suggestion. This is very helpful because now small proposal owners can see if there is enough money in the current budget cycle and if they have a chance of getting that funding without risking losing the 5 DASH on a lost cause. The information regarding core proposals is now in the place that people need to see it i.e. in the current funding cycle. In case you are not aware last month many small community projects was burned with their 5 DASH due to core dropping in an unexpected 3rd proposal which used up all the available funds. Some DASH was eventually freed up but only by de-voting past proposals however this then causes damage to the past proposals which is not good. Would it therefore be possible to have a specific Core Funding section in Nexus so that core can post their proposed up and coming funding proposals. This would include information such as number of proposals, the month they intend to post it, what it is for and the approx amount of DASH. In this way small community projects can make more informed decisions and plan their strategies about whether to post their proposals or not and therefore they could potentially save their 5 DASH proposal fees if core is planning to take the majority of the funds as they did on the last funding cycle. Last month 25 DASH was lost by small community projects due to this issue and this issue has occurred many times in the past. We need a solution to this issue. 5 DASH (around $1025 USD) is 8.5 years salary for someone in Venezuela who's average monthly wage is now just $10 USD. We couldn't agree more that planning for the future is extremely valuable to bother Proposal Owners and MNOs. Thank you for making these suggestions to both our team and Core! On our end, we are exploring making a widget that will show the budget allocation to accepted recurring proposals for the coming months. What we might also be able to do, is give certain verified organizations, like Core, the ability to post their 'intended proposals', which would make it much more clear how much funding will be available. One thing to keep in mind is that this falls outside of the original scope of the project and is a 'nice to have' feature, rather than one that is mission critical for the launch of the MVP. As such, this would be a feature tackled in a future phase. It would be great if you could contact us on Discord @yuribear or @jeffh so that we can discuss what other ideas or suggestions you might have. Could you state who would have the copyright ownership of the code that you develop. Will this code be made available to the DASH community? What languages will you be writing DASH Nexus in? I need to develop a governance and voting system to run the sDAO. I was thinking that if you made your code available to the DASH community I could have it adapted to create a governance system for this sDAO. The DASH community could then create sDAOs for many other specific genres. The problem sDAO's solve is that MNOs do not have enough time to assess all the proposals are coming through and therefore they are just voting without doing enough due diligence. I have realised this for myself and decided to maintain quality I will focus my energy on supporting Venezuela projects. I have spent most of my time understanding this one specific area and in this way I am able to give better quality support and feedback to the teams. I want to now take this one stage further and setup a self funding sDAO for Venezuela with the aim to supporting projects that for one reason or another do not go through the main treasury. I was thinking that the DASH governance structure you intend to develop could be relatively easily adapted to run sDAOs. Will you make the code you develop with our funding available to the DASH community to be able to use freely for their own projects such as my sDAO project ? I like the idea, but there's a lot nuance into making something like work in practice. Would love to discuss further on Discord! Feel free to contact @yuribear or @jeffh on the Dash Nation Discord. If the code is made available to some community members, what would stop it from leaking to one of our competitors. Dash Nexus is being built to push the Dash project to the next level, why should we allow the competition in? As an alternative, you could possibly ask the Dash Treasury for funds to have the Nexus team customize and host a sDAO for your project. You could also wait for Evan to build and release his software for managing DAOs (but I haven't heard much more re: ETA). Maybe he will surprise us! Once it is up and running we could ask Dash Treasury to fund the Dash Watch team to extend their reach and look into any of your sDAO projects. The license for the software can be specific specifically that it can only be used for a DASH exclusive projects. If someone attempt to use or adapt the software we will have recourse for legal steps to ensure that. The license terms will also specify that DASH branding must be the exclusive branding on the software and we can specify that the location and manner in which the DASH branding is displayed. Release of the software would be to MNOs only only for the specified purpose. The MNO can sign a legally binding agreement that the software will not be used for anything other than the intended purpose, in this case setting up an sDAO for Venezuela. A procedure and protocol could be written into the agreement on how the code will be safeguarded by the licensee. Ideally sDAO creation functionality would be built into Nexus by default and this way the core team could maintain the code. However if this is not possible then the code could be released under agreed terms that maintain its use to promote only DASH related projects. I support this. I am new to DASH and find - although it is a great project - that many of the tools, wallets etc. of DASH are quite old-fashioned and outdated. For example, I just saw a project where you can vote directly from your wallet. Yes makes a lot of sense. It is a necessary project, and will lead to another level management of the DAO. You have my support. Thanks for the proposal, and for the interest in improving it. Thank you everyone for the overwhelming support!! We couldn't be more grateful to the Dash community for making this possible and couldn't be more excited to start development with STRV. Stay tuned for updates as we progress through the development stages. Great to see this is over the line, cannot wait to see Dash Nexus go live! It will be an incredible addition to our infrastructure, something to take Dash and DAO governance to the next level. Voting yes. Between this and Dashwatch we are finally building out our governance infrastructure in a meaningful way. All the differences highlighted in the video between the current system and this are soooooo necessary, this will be a huge improvement. In recent discussion on the Masternode channel, Jeff/DashNexus mentioned that they have a plan to build a "Request For Proposals" feature in Dash Nexus, AKA the Dash Bounty program. With RFP, the community can make known that it wants certain tasks accomplished. Then we are not at the mercy of just whatever shows up for proposals. It can be more guided and efficient. And I wish we could cram Frame 48 in there too, but now we have really run out of room. There is one other proposal that could probably be voted down to fit more into this budget. The Free Thought Project is expensive and I’m not sure if we are getting value for money out of that sponsorship. This is a perfect complement to DashWatch. Nexus will take care of the 1st half of the process, making it far easier for proposal owners AND far easier for the Masternode community to evaluate and vote on those proposals. DashWatch takes care of the 2nd half to inject and maintain accountability after the proposal is approved. MNO, if u havent voted for this, please do. this would be an amazing experience for MNO to assess proposals as they come in. Upgrading Dashcentral should be one of the highest priority projects and Dash nexus will be a great upgrade. It will allow voters to fairly allocate money to different concepts and not just spend money on one area. The treasury has a finite budget and choices have to be made, it is no good voting up everything and ending up with poor overall division. This will help with that. Ironically, this project itself is unlikely to be funded as most of the non-core budget is going to 2 north american sponsorships- Fanduel and Ben Swann for the same market. I hope that a choice is made between the first two and this finds a way to get the funds it needs. 1. What about user data and privacy? How will you handle that? 2. Also will you be needing additional funds when the site is up and running (since I can't see how you can make money on your own) ? 3. In case something goes wrong in the future who will be the owner of the code/site created? 1. We will be working with STRV to ensure that DashNexus complies with the industry best practices when it comes to security, as well as the recently introduced GDPR privacy regulations. STRV has a track record of developing applications for major organizations with highly sensitive user data: LegalZoom, Lufthansa, and RichUncles (an investment platform). 2. Costs to cover Heroku, AWS storage, message queuing, and email notification sending will vary with usage, but should not exceed $500/month and we intend to use any remaining funds from the contingency budget to cover these for as long as possible. Beyond that, we will be open to donations and if those will not be sufficient - we will put up an additional proposal to cover 12 months of hosting. We also want to make sure that Nexus remains relevant as the needs of the network evolve, so we will be putting together a roadmap for future development closer to the launch date of the initial release. All future upgrades will be presented in separate proposals for the network’s consideration and will require significantly less resources than the initial development. 3. The DAO - and by extension, the Treasury, are core components for the Dash network and as such we plan to set things up in a way where the network can own DashNexus, much in the way that Dash Core Group, Inc. is being set up to be owned by the network. This will allow the network to retain ownership of the codebase and to appoint a different governing board should we fail to meet the network’s expectations. This will require rather extensive legal discovery because this is still uncharted territory and there are multiple ways of setting it up from a legal perspective. This discovery will be covered by the funds allocated towards ‘Legal’ work in our budget and will result in us determining whether a Trust structure or something like Dash Ventures is the best way to proceed. Thank you for taking the time to evaluate our proposal and to ask the thoughtful questions! Please let us know if there is anything else you would like us to clarify. I am disappointed this isn't passing. This both good for Masternode voters, and for the outlook others have on our projects. This looks and feels so much more professional. One remark I think you should put it up to vote if we need all those langues on Dash Nexus, one langue aka English should be more than enough, people should be able to understand that langue, transactions take up to much time and money, and are often less than 100% accurate. Only for perhaps, non-english speaking proposal creators, there should be some one to help do the translation or something. We have received a great deal of feedback on our original proposal from international members of the community, specifically requesting multi-lingual support. We believe that making the platform accessible to non-english speakers will broaden its reach and allow the Dash ecosystem to expand even faster. 1. Automatic Comment Translation - this is fairly trivial and involves integrating some simple, pre-made solutions that will allow people to translate comments in the discussion board, similar to how facebook does it. 2. User Interface - here we can provide a great deal of utility by providing language options for all menus, buttons, and other UI elements. This work only has to be done once and can be done with perfect accuracy. We will start by providing options for languages that are broadly used by the Dash community, such as Spanish, and expand the selection based on community demand. 3. Proposals - this is certainly the hardest element to translate, as it requires a great deal of accuracy and detail and has to be done for each proposal. Tools like Transifex make it possible address even these, but they do require additional resources for each language and their cost increases with the number of proposals, because of the human effort involved in verifying the translations. In building our platform, we want to make sure we include as much as possible of the 'low-hanging fruit' and lay the foundation for future development and broad multi-lingual support. Any complex features that will require significant resources will be presented to the community for discussion and voting to gauge their necessity and priority. Please see page 17 of the Nexus Feature Overview document for additional details about our plans multi-lingual support. Please make videos front and center. A proposal with a video is much easier to evaluate than just text. So proposal owners should have a strong incentive to make a video and it should be front and center for those proposals that do provide a video, like with Kickstarter. That said, I don't think it's worth the effort and cost to build dedicated video hosting. I would rather watch the videos on YouTube where I have all the YouTube features that I'm used to and it's recorded in my YouTube history. Thank you for your feedback! We couldn't agree more that videos are an extremely effective form of communication and we will definitely be putting them front and center. Proposal Owners will be able to embed videos from both Youtube and Vimeo, but we do believe that offering an additional option to upload videos directly to the platform will be beneficial to those who may not have accounts set up on external platforms. This would allow for a more streamlined Proposal Creator flow, where the user can complete all the steps without ever having to leave the site. As far as costs are concerned - there are many pre-built solutions for video uploading, which will keep development costs to a minimum and data hosting is quite affordable at roughly $20/TB/month. I disagree that videos should be the focus. from the proposal owner perspective: Good videos are hard to produce and specially, to change if you need to adapt to feedback. I rarely watch the videos attached to proposals. I find tedious to have to watch a 30min video to understand what a proposal is about and this should not be the default. If something changed from initial proposal, do I need to watch the updated video again to detect what changed. Texts can be easily edited and diffed. Looks like a massive upgrade to the seriously flawed and inefficient current proposal submission system. Looks great - well-needed and an A-game team implementing it. Yes from me. I hope this proposal passes! It’s clear the Dash Nexus team have put a lot of thought and effort into it, and this is something we need to take us to the next level. Our treasury proposal system is what sets us apart. It's time for a upgrade. Voting yes. Hosting costs for the platform will run under $500/month with some variability depending on usage (how much content ends up uploaded to the network and actual number of users). We will use any remaining funds from the contingency to cover ongoing costs and will let the network know in advance if additional funding is required. If the community is satisfied with the quality of our work - we would consider coming back to the network with additional proposals, which would include new features to address the network's future needs. These would be optional add-ons and not impact the ability of the platform to operate. We have the full team Nexus team staffed, including PM and QA. We are ready to execute upon the network's approval. i love this! sorely needed. I seriously urge all MNOs to watch the entire video and look at what DashNexus intends to implement. One of the biggest problems we've had as a DAO is that we have so many disparate platforms across which all kinds of important information and discussions are scattered, and for people who are trying to enter in to our space, it's very unlikely that they'll find out everything they need to know without a lot of trial & error and work on the part of various community members pointing them where they need to go. Having a central place that aggregates all of this important information and provides a hub, a jumping-off point is something that this ecosystem *DESPERATELY* needs. If the DAO is going to be distinct from the Core Team, and our relationship is going to be reflected in practice, a slick, sophisticated, efficient, and powerful platform is essential. In the course of my duties as one of the more active MNOs, every month, I'm talking to lots of proposal owners, checking multiple platforms (Forum, Discord, DC, DW, etc) daily, have dozens of tabs open all the time, etc. A platform like this would *drastically* reduce our workload and *drastically* improve the efficiency of the DAO on many different fronts. If the cost is a concern, think of all the disparate projects we wouldn't have to fund on a regular basis, think of all the work we could consolidate. There are so many exciting parts of this platform, such as real-time translation bringing in the participation of developers from around the world that might not necessarily speak English. If we're truly wanting to be a Global payment system and form of currency, we need to be able to interface with everyone who has something to contribute. The other great point is that the proposal owner will be able to work directly with the development studio, and the studio has a lot of high profile clients. If we want something of this magnitude--and I know I certainly do--then we need to be willing to see it through. The DAO really needs this. DC has been a huge benefit to us, but a platform like this is the next step. If we're going to be a multi-billion dollar organization, we need the utilities and platforms to facilitate it. Dash can afford this. If we're going to take the DAO forward to the next level, Dash can't afford not to have this. With the Trust and Dash Ventures and all these critical projects moving forward, we're going to need to invest in our ecosystem, and there is no better investment than critical infrastructure. The DAO needs its own web presence that it owns, and this fills that role superbly. The other part of this that is terribly important to me about this proposal is how nice and streamlined and efficient it makes the process for proposal owners and contractors and other non-MNO participants in our ecosystem. It's no secret that working for the DAO right now is hellacious and nerve-wracking for proposal owners. All sorts of arbitrary demands from anonymous employers, inconsistent views and mixed messages about what the DAO wants out of you, your funding always at stake, etc. Having all of these utilities takes a lot of the guesswork and uncertainty out of the proposal process and gives us as MNOs a lot more leeway and opportunity to work with proposal owners directly to ensure we're attracting the best possible developers and contributors to the ecosystem and that we're able to help them tailor and hone their proposals to add the most value to the network. This is perhaps the most important aspect of what this particular proposal does for the DAO. As it stands, it's a wonder *anyone* jumps through the hoops of our mincemeat, motley, patchwork system for funding. This would vastly improve the user experience, efficiency, and systemic outcomes for the entirety of the DAO and its processes. Completely agree we need something like this ASAP and it will take some time to build. After the initial four-month proposal what will be the sustained costs to the network? I am down with paying for this, and maybe one or two other proposals in the future to add features when Evolution comes out, but I'd like to avoid a permanent line item in the budget for this. Secondly, has the there been any discussion about setting up the commenting section so people can post positive and negative comments in a different section, or perhaps give them a different color outline so that MNOs can quickly see the arguments for and against a given proposal? We will use any remaining funds from our contingency budget to cover ongoing hosting costs, which are projected to be under $500/month. As for the discussion board - we will be exploring further options to improve its functionality with the STRV UX lead. One thing we need to be careful of is introducing unintended biases and externalities, which may come with automated sentiment analysis and visual cues. At the end of the day, we want to make sure people read the comments and actively participate in the discussion, rather than jumping to conclusions based on color coded messages. We are open to community suggestions and will be testing various versions of the discussion board with the aim of striking a balance between utility and community engagement. We need this. Well thought project, that includes a lot of feedback. Had lots of discussions with Jeff about this proposal, he is committed to improving our DAO tools. Voting YES and recommend everyone to watch the video. #1 Is it appropriate to fund this proposal at this time? Improving the user experience for MNOs, whilst a good idea and quite a necessity will most likely take second priority while allowing for adoption and marketing proposals the ability to pass that are so crucial at this stage, providing that the budget continues to be as tight as it has been recently. #2 Is the expense justified for the cause? $460,000 is quite a sum. Also what would be the ongoing costs to maintain the site once it's up and running? I believe that we are often unaware of the reoccurring costs that creep up with some proposals, further tightening the budget. Thank you for evaluating our proposal and asking great questions! In regards to your question about maintenance costs - we expect this number to be roughly $20-30k/month immediately after initial deployment. That would include keeping a backend and a frontend engineer on staff, allowing us to make any necessary bug fixes and updates on the fly, as well as covering all hosting costs. We plan on developing a comprehensive support and maintenance plan, which will be published in month 4 of development as a separate proposal. 1. Making the Treasury more accessible will attract many new Proposal Owners, further increasing competition, but also increasing the quality of the proposals that ultimately receive funding. This means an average proposal will provide a higher ROI to the network. 2. Better tools will allow MNOs to save time each month when evaluating proposals. If we could save each MNO an hour of their time/month, that would add up to thousands of hours saved - an immediate ROI. 3. Development takes several months, so we need to anticipate the network's future needs. Starting development later could mean that we will be stuck with tools that aren't well suited to handle the increased activity around the Treasury. With that said, we are obviously biased in this regard, so our opinion on what deserves to be prioritized carries little weight. Please let us know if you have any other questions about the proposal and we will be happy to answer. I like the idea of many different sites that offer these services. However, we need ONE place where proposal owners make their presentation, and that presentation is "pulled into" these service sites. This way, MNOs can be assured to have the proposal owner's proposal information in their favorite user site, because as a MNO, I only want to use one website. I don't want to be sent to another website to read this or that proposal. So if you and DashCentral can both work together to create a way for proposal owners to make one entry, and "pull" from there the information to your perspective websites that would be perfect. Even better, if the forums could be shared, that's even better. This would be the ultimate in decentralization. If Proposal owners only needed to put up an HTML page somewhere for retrieval, super, I don't know how you'd set it up, but let me get everything in one place as a MNO, and if you do this, we could have thousands of such sites, in all kinds of languages, servicing the world, while seemingly being centralized. I can see this even being "pulled" from our future Dash Drive, and really being decentralized! I don't think housing these other organizations on the same site or aggregating their content is the same as centralization. Aggregation is not centralization. This is no more centralized than the DAO itself. It doesn't make sense to have disparate websites where participants in the ecosystem have to go to find this or that information or to do this or that activity if a solution like this would facilitate it as well or better. It's much less costly and more efficient to add functions and features to an existing site than to build multiple others. I understand your point about having decentralized organizations filling different roles and aggregating their content on the same site, but there's no reason they can't all be housed on the same site as well, it accomplishes the same thing if they're all operating independently. If you look at the video and accompanying documents, this site will facilitate coordination and contribution from our other partners like Dash Watch in a streamlined package. It's basically facilitating the thing you're describing. I'm writing horribly, so I want to clarify my vision, and with both your proposal and the other DC proposal, this is the perfect time to WORK TOGETHER to make it happen! MNOs choose the website they want to work with (future might be hundreds or thousands, they can all be in different languages, they might even auto-translate using google translate?) The MNOs see all comment posts, no mater which site they use, and all proposal owners submit one time, their proposal in whatever format, which the websites "pull" from to fill in the information. I know this can be done, it's done with millions of other things. Some type of API, maybe utilizing the DAPI and the Dash Network (ultimately definitely) Hope that clarifies the vision. THAT I would vote on! Yes, that seems feasible (the use of an API or the DAPI or something along those lines to aggregate content), but what I wanted to communicate is that if you watch the video, the integration and coordination of information from other site projects (like Dash Watch) is explicitly mentioned. I have spoken at some length with the team behind Dash Nexus and how receptive they have been to feedback both in their previous proposal and in private has been a testament to them. They are building something for and owned by the DAO that meets so many needs across the board, everyone involved in Dash in any form will benefit from this platform in numerous ways from accessibility through to ease of use. This will empower proposals with more feedback, accountability and transparency and provide structure where previously there was chaos (images, tables, google docs, paragraphs, etc). Please, watch the video / read through the feature detail pdf - in my view this product is essential for the DAO before the launch of Evolution & Dash Ventures and the influx or proposals they will bring. The work that's gone into it and the diligence the team have undergone in developing and researching this product, the development partners and more can't be understated. I would like clarification about one thing you mentioned at the end of the video though. You said you hope the network will own the project. Could you give more details about that? My concern is, how locked in are we to the team that builds and maintains this? *What if* the maintenance cost of the site starts creeping up unreasonably or features don't get created fast enough? What kind of say would the "the network" have? Can they hire a different team to maintain/build upon it? You said the network should own the codebase - does that include the server/data (all the uploaded photos/videos/text)? How would that be transferred to a new team? Would it be open source already for other projects to use? Or do they just put up a proposal and if it passes, then the current team hands over the code, or ...? Thanks for the support! Just took the time to read through that Reddit thread and you were right, we came to the exact same conclusions that you did. Short answer, the network will own Nexus. Long answer, it's going to take some time to make this happen and that's why we've allocated some funding towards legal work that will allow us to transfer ownership of the codebase and hosted data to the network, as well as create a mechanism for the community to replace the management team while retaining control of the platform. We're building the application with modern web-frameworks, automated testing, and documentation, so that handing it over to another developer will be as smooth as possible. Wait a second, how come the grand total is $460,000 but you're asking for 296 Dash? I voted no for this last month because it was too expensive at $250,000, and now it's almost double? I thought this would all be done for 296 Dash (114514 USD). Please explain. Also break this into milestones, deliver, and come back next month for more money. The original DashNexus proposal asked for $270/month for two months to deliver an MVP and was projected to cost close to $1M for the entire build. Based on the feedback we received during the previous budget cycle, we conducted a comprehensive bidding round to find a cheaper solution to building a world-class platform. In our quest to find the best option, we received quotes from over 20 development houses based in the Ukraine, Russia, India, Ireland, Argentina, Colombia, and the US. We feel confident that together with STRV, we can deliver a fully functional, enterprise-grade platform for $416k - nearly a 60% reduction from the in both the burn rate and the total cost from the original proposal. The additional $44k covers the 10% contingency risk and proposal submission fee. In the event that the dash price remains the same or increases - we will use the additional funds to perform ongoing maintenance and further development. If the price increase is significant enough to cover the cost of the entire project after month two or three - we will ask the community to vote down this proposal in its last budget cycle. 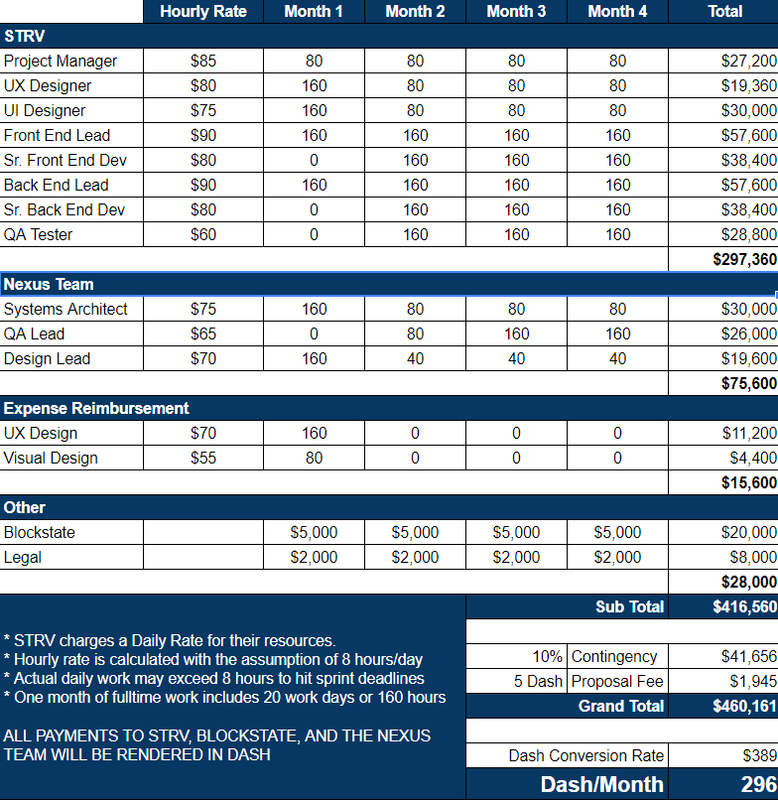 To get more details about our cost structure, please view the STRV Proposal Link and our budget chart. We are happy to answer any specific questions about why each of the resources is necessary for the execution of this project. In terms of deliverables - we will produce bi-weekly community updates, where we will report our progress and present materials such as the completed design system, development backlog, and alpha/beta releases. We believe that an effective communication plan, paired together with the structure of a multi-month proposal, provide Dash community with sufficient protections in lieu of escrow. Thank you for the answers, you've got my votes!